What Colour Works Best for Your Kitchen? The post What Colour Works Best for Your Kitchen? appeared first on Kitchen Blog | Kitchen Design, Style Tips & Ideas | Kitchen Warehouse UK. Finding the right colours for your kitchen can be the difference from a fantastic design and one that looks disjointed and uncoordinated. What colour works best for your kitchen? This is a question that we are going to explore in this weeks’ blog at the Kitchen Warehouse. You might have great cabinets, a new floor or modern appliances but if you mess up the wall colour this can all be in vain. Choosing the right colour to suit your design is vital. There are a few things to think about first and questions that you need to ask yourself. How much natural light do you have? The size of your kitchen and how much natural light you have will have a big impact on your colour scheme. Kitchen’s that have a lot of natural light coming in can afford to have a darker colour on the wall. This could be with windows or even skylights and if there is an abundance of sunlight coming into the room you can potentially choose a duller colour. This is because there is light coming in anyway. In smaller kitchens or kitchens that have limited natural light, using darker colours can have a negative effect. It can make the room feel smaller and claustrophobic. However, does this mean that dark colours should be avoided altogether? Should you avoid darker colours? Not necessarily. Even if you don’t have much natural light this doesn’t mean that you can’t have a darker shade on your wall either. Some people say that darker colours and dark neutral colours don’t promote hunger which is kind of going against the whole point of the room! That being said, the design of every room in your home should be to your taste. If you like darker colours then why not have a dark blue or dark grey on your kitchen walls. If you prefer lighters colours then go for that. Darker shades shouldn’t just be avoided outright. There are a lot of factors that can compliment navy, blacks or grays in the kitchen. The debate about what colour works best for your kitchen can last for days without really getting anywhere. We have picked out 5 different colours that are generally universal. OK, so this isn’t ‘one’ colour per se however warm neutrals cover a range of shades that can work wonders in your kitchen. Warm neutrals have hints and shades of brown, red, orange, or yellow undertones and work with pretty much any other colour scheme. The reason that warm neutrals tend to work better than what we would call cold neutrals (think colours with undertones of blue or green) is because they are more inviting. These colours fell a lot more homely and provide a friendlier nature to the room overall. You can combine warm neutrals with pretty much anything from striking kitchen cabinets to wood. They are also a good idea to use in a kitchen with an accent wall as we will see below. White can often be seen as a bit boring but it is highly effective in creating a clean and minimalist design. If you want a kitchen that looks uncluttered then white is a great choice. 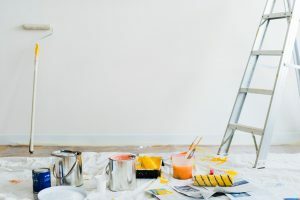 In fact, white painted rooms have an energy about them and as the kitchen is one of the first rooms you go into in the morning in search of some caffeine, white walls can offer a subconscious perk me up. Why not go white on white and combine this with white kitchen cabinets? It is a popular design trend and is becoming a real hallmark of modern kitchen design. Blue is a colour that is not automatically associated with kitchen design. That doesn’t mean that it can be used for great effect in the kitchen and it doesn’t even need to be as an accent colour either. The thing with blue is that it provides a real crisp dimension to your room. It is recommended that you use it quite sparingly so resist the temptation to cover every part of the kitchen in blue. If you are wondering what colour works best for your kitchen and are stumped for ideas that are a little bit different than the norm then consider blue. It isn’t that common and will make your kitchen have a unique slant. We’ve blogged about having green as one of the primary colours in your kitchen before – Why Green Is The New Must Have Colour. Many people think that green is outdated and is better left as a design trend a few decades ago. This isn’t the case. Green can be a very effective colour to have in your kitchen and it can blend in and work very well with whites, grays and other light colours. Not only is it a very inviting colour it is natural too. Green reminds us of nature and if you want a calm and relaxing vibe to your kitchen, a light shade of green can really help to achieve this effect. Finally, we have yellow. A nice bright colour that reminds us of sunshine and summer days. Can it work in your kitchen? Yes! if you are wondering what colour works best for your kitchen then yellow should be a stronger contender because it can go with nearly anything. In fact, if you have a lot of gray in your room then yellow works fabulously with this and helps to bring it to life. Yellow is great too at reflecting light so if you have a dull kitchen or one that doesn’t receive a ton of natural light then yellow can help to brighten to the whole room. If you are still debating what colour to paint your kitchen or if you think it could do with something to make it appear more modern then consider an accent wall. Creating an accent in your kitchen is very easy and can have a massive effect on how your room looks. It can bring attention to one particular part of the room or even just break up an monotony of colour. A kitchen accent can take many forms from accent lighting, accent kitchen cupboard doors or even just painting one room different than the rest. The possibilities here are endless. So, what colour works best for your kitchen? Like everything when it comes to kitchen design, it depends on you, your tastes and what you want. The colours we have shown you in this blog will generally go with anything in your kitchen. This is why they are so popular but don’t be afraid to experiment and try something new. Just remember to ensure that you don’t make your kitchen feel smaller wither dark colours if you have poor natural light or make it overly bright with light colours in a room that is already well lit. Whether you play it safe or go for something a bit left field, adding a splash of colour to your kitchen can really transform the room even if you don’t do anything else.